Kushan king or prince, Greco-Buddhist art of Gandhara, 2nd-3rd century CE. 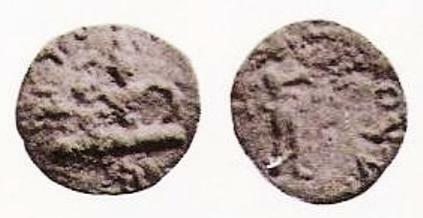 Offerings found in Bodh Gaya under the "Enlightenment Throne of the Buddha", with an impression of an imitation of a coin of the Kushan emperor Huvishka, 2nd century CE. British Museum. Kanishka, Mathura art, Mathura Museum. The Qila Mubarak fort at Bathinda, India was built by Kanishka the Great. Kumara/Kartikeya with a Kushan devotee, 2nd century CE. Kushan prince making a donation to a Boddhisattva. Kushan coins showing half-length bust of Vima Kadphises in various poses, holding mace-scepter or laurel branch in right hand; flames at shoulder, tamgha to right or left. On the other side of coin is a deity with a bull. Some consider the deity as Shiva because he is in ithyphallic state, holds a trident, and the Nandi bull is his mount, as in Hindu mythology. Others suggest him as Oesho, Zoroastrian Vayu. The Kushan Buddhist monk Lokaksema, first known translator of Buddhist Mahayana scriptures into Chinese, c. 170. Listing of Kushan royal tamgas. The first known Kushan king Heraios (1-30 CE). Kushan Empire Facts for Kids. Kiddle Encyclopedia.